We’re a few months away from Baby #2 here in the Rowland household and Stadium Visits will slowdown temporarily as we look forward to the wonderful crazy-ness to come. The last game before this brief break was a short journey an hour down the road. I only have eight stadiums left on my list to visit that can be considered a day-trip and I’ve been holding out on the PPL Center in Allentown until now. It’s been five years since the building opened and the AHL debuted in the Lehigh Valley. I’ve learned to give new facilities a grace period of at least five years as it does a number of things: addresses initial opening problems, allows for finishing nearby development, tries to weed out the beginning surge of fans going because it’s the hip thing. This was an arena I was looking forward to seeing and it becomes the 12th AHL building in my book. Just four more left to complete the Eastern Conference. Allentown is a city that I’ve been around many times, but never completely in. Similar to their big-league affiliate in Philadelphia, downtown is called Center City. They’ve done an impressive job creating multiple mixed-use sections that coincided with the arena opening (at a cost in terms of money and eminent domain). However, the drive south after departing US-22 made me think of the Billy Joel song. It’s a 180 from the glitzy new development around the PPL Center. The arena itself doesn’t really stick out as it is part of several other buildings, including a new hotel. Inside, soft yellows give a different tone than the Phantoms’ loud black and orange. There’s a nice lobby, but the space is not all that expansive given how new the facility is. Premium seating is abundant here and take that for what you will. I did really like how they stacked the club and double-decker suites on one side of the interior, leaving the other side with a more optimal bowl that includes an upper deck. They definitely have a nice look on the inside of this arena. There are some negative features made more surprising given that the PPL Center opened in 2014. There are obstructed views in the upper deck as dozens of seats have some sort of protruding railing get in the way of the ice view. In the lower deck, the rows are unusually narrow and the seat cup holders jut out, enough so that I bumped into it on two separate occasions. 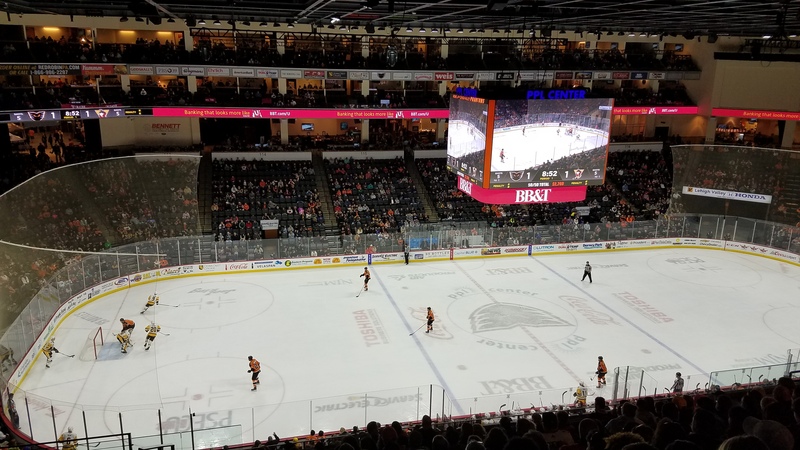 Just like they do for the IronPigs, fans continue to support the Phantoms quite well, though this Saturday Night game was laughingly announced as a sellout (see pic above, I’d say it was 65% full, at best). They were a lively bunch even in spite of them fading in support as we went through the third period. 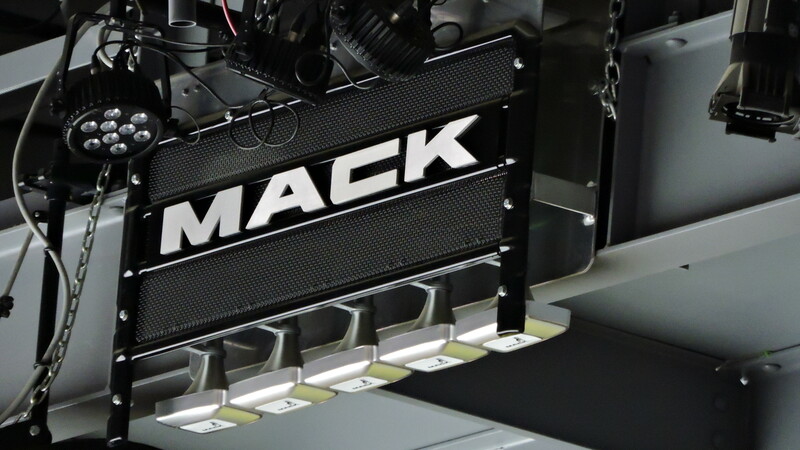 One awesome feature in the Phantoms/PPL experience: the goal horn is the sound of a Mack Truck as Allentown was the long-time headquarters for the company. These two rivals gave us an entertaining matchup that featured goals, plenty of chances, a fight and late drama. Sam Lafferty got WBS on the board first, but it only took 28 seconds for the Phantoms to answer as Philip Samuelsson connected on a sweet one-timer. The Baby Pens scored the next two, the latter coming in the middle of the second after they put away a rebound after a spectacular save. LV came back with three unanswered and it looked like they were going to hang on as third period dropped a level in play. However, Lafferty got his hat trick on a game-tying goal by crashing the net with just 59 seconds left. In overtime, a horrible turnover by T.J. Brennan led to a Ryan Haggerty converted breakaway as the visitors went home victors.